Place soup pot over medium heat; drizzle in olive oil. Stir in ham, garlic, leek, onion, carrot and celery. Season with bay leaf, thyme and oregano; saute until vegetables begin to soften, about 15 minutes. Add lentils and stock, and increase heat to high; bring to a boil. 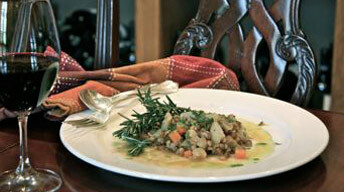 Decrease heat and simmer until lentils are tender, about 45 minutes. Stir in fresh herbs and season to taste with salt & pepper.